Speaking at a Wednesday luncheon fundraiser, sponsored in part by ConservativeHQ.com Chairman Richard A. Viguerie, Vice President Mike Pence gave Virginia Republican gubernatorial candidate Ed Gillespie his strongest personal and political endorsement. 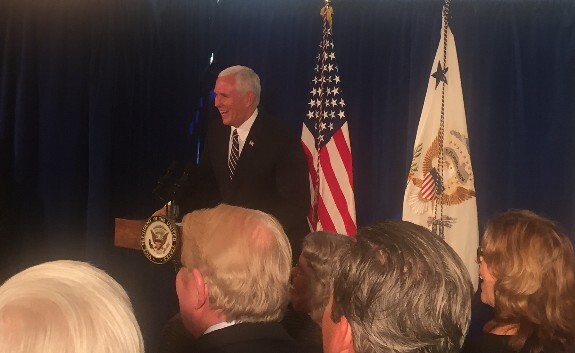 Pence, speaking extemporaneously to the packed house, compared his immigrant heritage to Ed Gillespie’s, remarking that both have a grandfather who emigrated from Ireland to the United States, observing that only in America could their grandsons stand before you today, just a generation later. The Vice President also remarked upon Ed Gillespie’s improbable rise from parking lot attendant to Chairman of the Republican National Committee, attributing Gillespie’s success to an incredible appetite for hard work, a customer service orientation and a “winsome” personality – a remark that drew chuckles from the crowd well-acquainted with Gillespie’s famously affable demeanor. But most important to conservatives, who after a bruising primary may have come to associate Ed Gillespie more with the Republican establishment than with Trump’s conservative – populist movement, Pence set forth in some detail how the Trump – Pence MAGA agenda and Ed Gillespie’s agenda for Virginia complement each other. As President Trump has declared war on MS-13, the Central American transnational criminal gang terrorizing Northern Virginia, so Gillespie has made “Make Virginia safe again” a major part of his campaign. Gillespie recently pledged $1.5 million in funding for the Northern Virginia Regional Gang Task Force. The Thursday announcement followed a Washington Post report that there are more than 2,000 gang members from 80 gangs located in Fairfax County alone, including a shocking 1:1 ratio between MS-13 and Fairfax County Police. Likewise, as President Trump and Vice President Pence have made growing the economy a central part of their agenda, so Gillespie has laid out a comprehensive economic growth plan that will serve all Virginians. The choice facing Virginians in the gubernatorial election is much the same as the choice facing the rest of America in the day to day work of Congress: One choice is about policies favoring long term economic growth that will provide jobs and prosperity. The other is to favor approaches that grow government, saddle the private economy and taxpayers, stall economic growth, and make it difficult for Virginia to compete successfully with other states. Vice President Pence spent the rest of his time on the podium emphasizing two very important points; first, that Gillespie is running to be the Governor for all Virginians, whereas his opponent, Ralph Northam is running to be the leader of the opposition to President Trump, and second, that while Ed Gillespie has put forth a detailed, positive agenda for the Commonwealth, the Democrats and their liberal out-of-state allies have concentrated on trashing President Trump and slinging mud and fake news at Gillespie. Ed Gillespie has chosen to counter this mudslinging by staying on the high road and talking about the issues. Vice President Pence closed his remarks by appealing to the crowd to “dig deep” and do everything they can to help turnout the vote by talking to their friends, neighbors, family, church members and others in their social circle and asking them to vote for Ed Gillespie; there’s nothing like a personal endorsement, said Pence, “it’s time to own this election” and ask your friends to vote for Ed Gillespie he concluded. “This will be a very, very tight race” said Pence, and the latest polls appear to bear him out. With the 2017 Virginia election less than two weeks away, Republican nominee Ed Gillespie has an 8-percentage point lead over Democratic gubernatorial candidate Lt. Gov. Ralph Northam, according to a poll released today by the nationally recognized Hampton University Center for Public Policy (CPP). When Virginians were asked if the election were held today, 41 percent of those surveyed would vote for Gillespie and 33 for Northam. The remaining 27 percent were undecided. The key (as in last year's presidential election) are the 27 percent of the likely voters who remain. Even though the poll found Ed Gillespie leading Ralph Northam 41 percent to 33 percent, with 27 percent undecided or refusing to answer the race is trending Ed Gillespie’s way, but still very much up in the air. The Virginia statewide election is Tuesday, November 7. We urge our CHQ readers and friends in Virginia to heed Vice President Mike Pence’s call to “dig deep.” The MAGA agenda is on the line in this election, and it is time to own the vote. We urge you to talk to your friends, neighbors, family, church members and others in your social circle and ask them to vote for Ed Gillespie for Governor of the Commonwealth of Virginia.